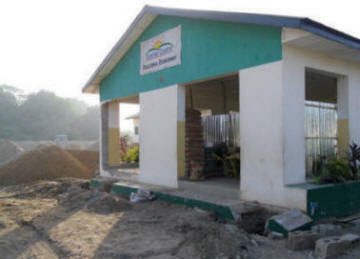 Thanks to our donors we have the £40,000 for Phase 1 of our Lower Basic school. 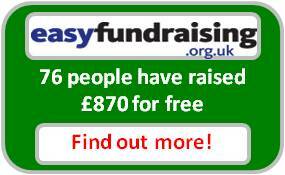 Now we need another £23,000 for Phase 2 ! Can you help us? Whilst Sunrise was closed and no students, small children or teachers were present, we able to make a start building Phase 1 of our Lower Basic school (see plans within the website for more detail and pictures). 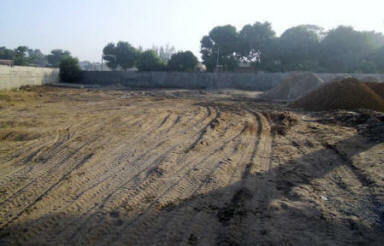 We have just enough cash to start work on the foundations, 2 classrooms, toilets and 2 other staff/library rooms. Clearing the site is a big deal but this allows delivery of essential cement, sand and chippings. However we needed to lose a little of our Hall space to allow the erection of barriers to protect students and children from the building processes. This also gave room for essential storage. Our builder, Eric Whitehead, and his team have also been able to remodel the front steps of the steps to create a new entrance way to the school hall. It was essential that all this work was completed to allow the school to re-open for Term 2 of the year. Dawn and Tony have judged the Christmas card competition and found many fine examples of local views of Christmas, not quite like the European snow scenes! Njange’s card has been animated and sent to all our supporters to wish them Merry Christmas and thank them for their help. The school is now shut until Tuesday 10/1/2012 and so is the blog. We’ll catch up with all the good stuff that GETS and all its helpers do every day in the New Year. Merry Christmas everyone! This week we were introduced to Mrs Horiza Dibba, who teaches Child Development to our nursery teachers at Brikama Teacher Training College. 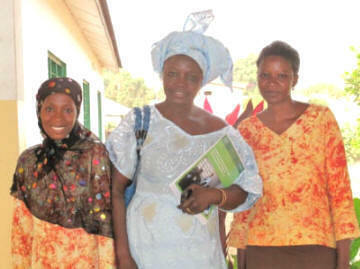 Both Fatou Sanneh and Fatou Cham are pictured here with this very important lady. The World Health Organisation appeared later in the week, this time Jack (their leader) came to give the Nursery children a measles jab and a vitamin supplement to help their sight develop properly. I also insisted that some of the teachers could benefit from the vitamin supplement and also set a good example for the children. He chose Mrs Cham first before he got most of us, including one or two volunteers! Mrs Jainaba Faal, our Tie and Dye and Batik teacher brought in some lovely examples of the other handicraft items that she has been creating at home. 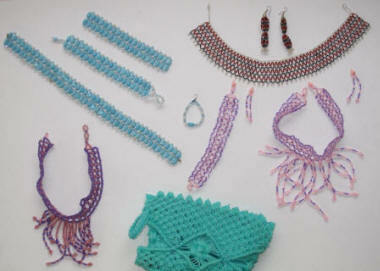 These fine examples of necklaces, bracelets and bags are all things that we can help the students learn how to make to broaden the range of skills acquired on their course. Something for next year perhaps. By the end of the week the students were all keen to compare the lovely fabrics that they had produced with Mrs Faal’s help. Examples are laid out here before the students took them home to their families. 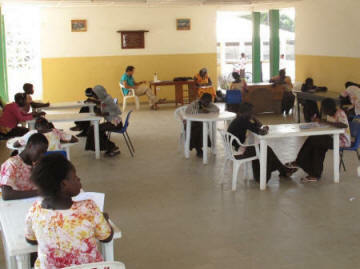 This week the teachers got on with setting examinations to test the Skills students. These took place in the Hall where it is quite cool to work and concentrate. Marking followed this and took up a lot of teacher time. Some engaged students from other classes to help with the process. Daniel English (one of our volunteers) and Joanna Mendy (Cookery and Sewing Teacher) can be seen monitoring the students. At the end of the week more gifts of resources came to the Centre, this time from Debbie and Graham Bradley, from the Isle of Man. They brought books, DVDs, a video camera, first aid kits and many other things, many thanks to them. Sendeng Suso (our Administrator), also pictured, is to become the expert on taking videos. Well that’s the plan anyway! 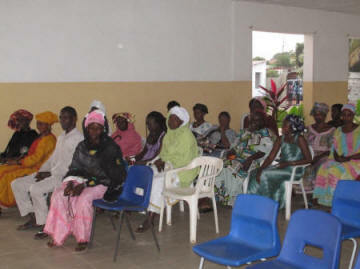 During the week the Hall was also the venue for a Parent/Teacher (PTA) meeting starting late in the afternoon. The Agenda was quite varied and covered areas such as feedback to parents on Punctuality, Dress Code and Discipline. In fact all the usual gripes from a school to parents, that I remember. We also summarised all the work that GETS had either done or planned to do in Sunrise to help the community. The parents all appeared very grateful for all this help and said so. The turn-out was a little low for the PTA meeting and the parents who came said that staff should ask those students who weren’t represented to bring their parents in to school first thing the following day before they carried on with further exams. Although I found this approach a little harsh, it seemed to do the trick. 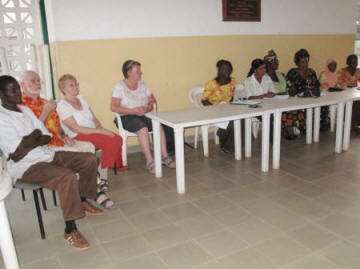 Many parents came in the next day to talk the teachers and offered to support the school and their offspring. Exams then continued . . . .
bringing even more needed resources for the Centre, teachers and students, to add to all that Dawn and Paul Webster brought the previous week. The photo shows Libby, Sue and Dawn trying to sort out the store cupboard at Sunrise to accommodate all that we now have. We also took delivery of 32 much needed brand Adult Numeracy textbooks for the skills students. These were obtained via the Gambian bookshop, Timbooktoo. Together with some teacher support packs, this was a very generous donation from a Trust fund. Other items, including a Netbook PC are also part of this donation. Later in the week Tony caught some of the students posing with their tie and dye practicals in the Hall at Sunrise, working with Mrs Faal - or so they all said! GETS is not just about working in Sunrise. We were able to support a football match and take Libby May to deliver Telford United football strips (sponsored by Libby's employer, Capgemini) to an Upper Basic school in Kiti village (near Brikama). GETS provided the match ball and refreshments at half time. The Head teacher, Mr Drammeh, was really grateful for all the gifts. The final score was sadly 1-0 against the Kiti school team. Libby also provided other clothes for the Kiti Nursery school and GETS provided some spare resources for the Kiti schools. We were also able to deliver a Christmas time gift from a UK company (PB Design) who kindly sponsor the Bah Family. The head of family, Mariamma, and her children, Isatou and Mo-Lamin were all keen to be pictured with the rice, oil and other gifts bought with the money that was sent by the company. The oldest child, Alhagie, sadly missed out on the picture, for he stays in Brikama during term time with relatives as he attends Brikama Methodist Academy. Our feeding programme provides all the nursery children with a mid morning snack of a filled sandwich and a drink that they all seem to enjoy. Just as a reminder that we are in Africa (lest anyone has forgotten!) we've included a picture of some other little monkeys eating their mid morning snack of mango. he forest ares near the Senegambia hotels are full of wildlife. Today we saw vultures and many other birds, monitor lizards, a ground squirrel, red colobus and vervet monkeys, all in a short walk OUTSIDE the monkey park. making painted masks and also making painted sandals to wear. The bantaba keeps the sun off the cookery class as they make doughnuts. We all try them, they taste great! This week has been very eventful, as is every week. Helen's brother and extended family came this week (Peter Scorer, son (Richard), Richards partner (Emily), Emily's mum and Dad (Ann and Colin Birch) and Emily's brother (Dan). We are extremely grateful that they seemed to bring nearly one of everything from our internet wish list for the centre. The tourist season is fully under way in The Gambia now and many people are writing to tell us of their visits and asking how they can help. Although there is much to do this is sometimes hard to answer in advance. When they arrive at the Centre, the priorities and opportunities are usually much clearer! We were also pleased to have another visit from Miriam Schneider, a German lawyer, who is holidaying in the area and loves to help put something back into the community where she is visiting. We hope to see Miriam again soon. Our fabric collection is mounting up. These are available for purchase. We have a local price (just about the cost) and a tourist price (which gives a small profit for school funds). 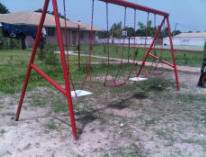 The students were all due back in school on Thursday morning, after the Tobaski holiday, but sadly only about 50% returned. We guessed that their parents had not returned from visiting their home villages in the provinces. 3 of the students that we asked told us that they travelled as far as Basse (far inland within Gambia), Cassamance (South Senegal) and another to North Senegal. An extra complication is that the Presidential nominations' day clashed with the return to school and maybe some parents and children believed that it was a public holiday. The kind donators of the money for our Watchman's Hut (Chis Rice and Helen Lee from Brisbane, Australia) came to the centre this week, along with Sheila and Nick Plaister. The photo shows Chris and Helen with Dembo Saidy, one of our watchmen, outside the new building. We still have a couple of improvements to make to the design of the hut to keep more sun and rain out and let more air in! playing games. At all ages the boys love to play with a ball. 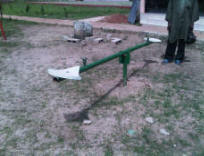 We are investigating playground equipment for the school. 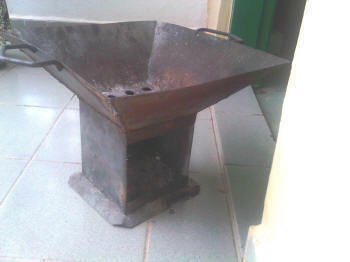 Here are some examples of locally made equipment. This week has been disrupted a bit by school holidays. Tuesday was a holiday for All Saints' Day and as we are preparing for the feast of Tobaski, the school will close on Thursday and re-open next Thursday morning. This will allow staff and students to travel to their family homes to enjoy the feast. There are many rams at busy junctions all over the Gambia waiting for purchase as the main ingredient for this feast. 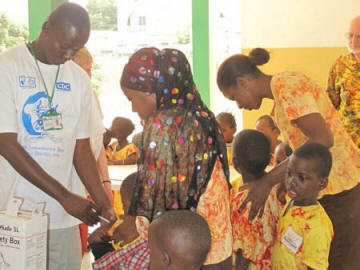 Health workers from Kick Polio Out of Africa visited the school on Monday, during their Bakoteh area campaign, to give polio vaccine and vitamin A supplement to all children under 5 in Africa. This is a part of a huge effort to eradicate polio. Last week we had a picture of one of our ex-skills students, Mama Nabeneh. Mama is 21 years old and graduated in 2009. She lives near to Sunrise in Bakoteh and has always wanted to be a school teacher so she welcomes the role that she has as classroom assistant. Mama said that her best subject at school was English, and she is putting that to good use. Our volunteer, Daniel English, was using an unusual approach this week. I heard the sound of the UK pop group Coldplay (Song - Yellow) playing in class. On closer inspection he was using the lyrics to help the students to fill in the missing words that he'd left off the blackboard. This helped with their spelling and pronunciation. They had great fun with this, lots of singing and drumming showed that they all knew the song. We had a visit from our first tourists of the season to see the Sunrise Centre. Jamie, Doug and Garth with their friend Lamin and taxi driver are shown in the photo. 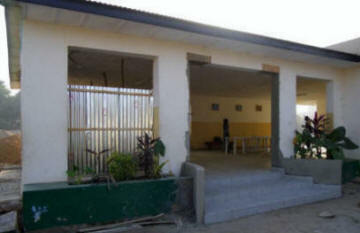 One of our goals is to get the tourists and their taxi drivers to come and see a local school in action. Sunrise is quite near to many of the hotels so it would be great to have them come and see us, and maybe help with a donation. This week Helen had to go to the other school that she administers for a Scottish Charity, from St Augustine’s church in Dumbarton. 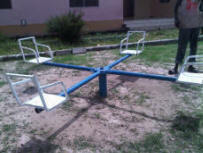 This school is London Corner, near Serrekunda and has 90 nursery places covering ages 3 to 6. When we arrived the lunch food was being prepared, cooked on charcoal open fires in large pots. Today it was Domada. The effectiveness of recent improvements to the chimney system to remove smoke from cooking were debated. "My name is Daniel English and I come from Wicklow in Ireland. I arrived in the Gambia about 7 weeks ago and plan to stay for about a year. Among other things, I will be helping Mr Ali Bah with Maths and English lessons once a week. So far, I have been really impressed by the friendliness of the teachers and the enthusiasm of the pupils. They are all attentive in class and all seem to do their homework, a little different from my school days! I am looking forward to trying to make some contribution to the great work being done at the school and education centre and hope to meet any of you who decide to come and visit." Mr Saidy, the Teacher in Charge at London Corner, helping to make papier-mache so that the children could build models. Here is Mama Nabeneh in Sunrise, wearing her new teacher's uniform. Mama was a former skills student who has come back to help as nursery classroom assistant. Helen is working hard to complete all the feedback to the fantastic people who sponsor over 50 children, all administered by the office in Sunrise. She hopes to complete this in the next couple of weeks. Friday is dress-down day (or dress-up really) when most can wear their best clothes, it is holy day for Muslims. The photo shows the nursery teachers looking very smart, singing and clapping in the shade outside their classrooms. This weekend we had another storm to refill the dips in the sandroads with water. I don't know how the children manage to keep their clothes so clean! The picture shows the road to the Sunrise Centre. Sunday's temperature was shown as "felt like 43 deg C", just before the storm, and it really did! Electricity has been a bit better of late and one day we had power for a whole school morning! The teachers celebrated by letting the children use the DVD player and TV. The small ones watched Nursery Rhymes and the big ones enjoyed David Attenborough's Blue Planet in their English lesson. Helen topped up the Cashpower meter (pre-paid electricity) with 5,000 Dalasi's worth to keep things going. Fatou Cham and Fatou Sanneh spoke to Dawn Webster, their UK Nursery advisor, on Skype, to give news about teaching progress. They reported that revision has been necessary with the youngsters after the summer holiday, prior to moving on with this year's nursery curriculum - no teacher will be surprised to hear this! Dawn will refresh the nursery teachers, from Sunrise and London Corner schools, with a training session in Jolly Phonics when she comes next month. Our Maths and English teacher, Mr Ali Bah, has been teaching rounding and estimating, prior to starting to work with calculators. Our cooking and sewing teacher, Mrs Joanna Mendy, managed to acquire additional local cooking stoves for only D150 (less than £3.50 each) from our local welder man, who has a workshop next to Sunrise. Joanna is now working hard with the students to make new brown uniform skirts since the local supplier doesn't have some sizes left. Finally don't let anyone say that it is all hard work out here in Africa. I caught Helen trying top quality ice cream in the local tourist area. It looks great! We have found a great new skills teacher, Mrs Jainaba Sanneh Faal. She will start helping the skills students with Tie and Dye and Batik, but she can also teach basket weaving, soap making and jewellery making. Sad news this week was that the father of one of our night watchmen (Dembo Saidy) died. The Muslim funeral is a very rapid affair and Dembo has had to travel quickly to his family home to the east of Brikama. The other watchman will work extra shifts to cover him. Mr Batchilly has malaria this week and is at home. The disease is very common in this area at the moment. A course of tablets or injections over about a week helps to minimise this horrible illness. We have had a new cleaner (Marie Correa) making a huge difference to the school, making the school feel better to live in for everyone. She has worn out three local mops now and we're trying best quality Addis ones to see if they survive the pressure! We continue to use Skype a lot to communicate with the UK and have used it put the skills teachers together with Erica Wren to offer advice and guidance, mostly on English and Maths. Dawn Webster has a call booked with the nursery teachers next week to talk to them. Tony has been taking more pictures, including this one of Mrs Joanna Mendy, teaching sewing in our new Bantaba and some more pictures of our nursery children. are bound to recognise Alfusainey! Story time with Mrs Fatou Sanneh and Nursery 2. One of last year's graduates from our skills centre is now helping in the nursery classes. Helen has been busy meeting children who are sponsored by GETS members as they bring in their last term's report and are given a cheque, payable to their school, for their school fees for the coming term. Our nursery and skills classes started this Monday, after the worst of the rainy season, although the roads remain wet and the rains continue, filling the potholes in the roads. Helen's little car got stuck in the mud and water came up to the boot level - the car is still drying out! Lack of electricity makes things difficult, but we've bought new batteries to improve our local power alternatives. Tony took this picture of some of the skills students wearing their new uniforms - the tops were all made by last year's students in the tie and dye classes and then tailored by the skills students in the sewing classes. Two of our successful first year students have their second year sponsored by a GETS member, as their families could not afford to pay their fees. Our tie and dye teacher, Mr Fayenkeh, left at the end of the summer term to attend to his family business, so this week Mr Batchilly and Tony will be interviewing candidates to replace him. Congratulations to Kaddy Jawara, one of our nursery teachers, who had a baby boy on 23 September - both are doing well. Our other two nursery teachers, Fatou Cham and Fatou Sanneh are back with us after their summer teaching course at Gambia college. Many maintenance tasks and some building improvements are scheduled. We've planted a mango and an orange tree, for shade, and we are busy clearing the site of all the rubbish that has accumulated over the summer holiday - this is Gambia!